I must say up front that I am not a huge fan of peanut butter...but Ryan and Clarise are! That's why we always have it in our pantry...big jars of them! They both love it in sandwiches...Ryan with cheese and Clarise with strawberry jam. She enjoys using it as dip for carrots & celery too! 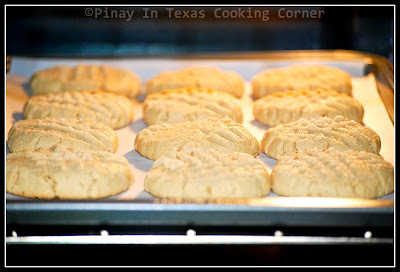 And if there's one kind of cookie that Clarise can't live without, I think it would be peanut butter cookies! I usually don't like making food that I know I won't enjoy myself...but because it's my daughter's favorite, I have no choice. 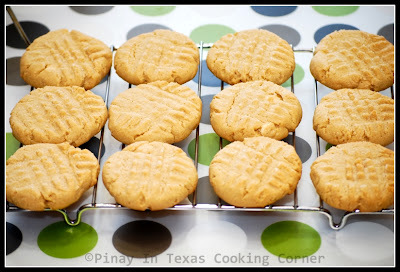 This is why I really love this effortless peanut butter cookie recipe! It's so fast and easy to make! 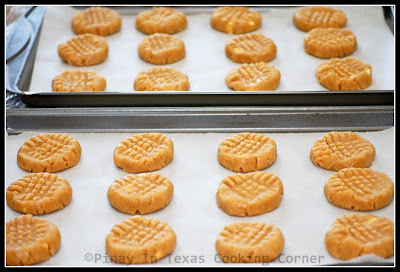 You'll have delicious homemade peanut butter cookies in less than 20 minutes! No sweat! I'm sharing this on Tasty Tuesdays, What's on the Menu Wednesday, Foodie Wednesday, Let's Do Brunch, These Chicks Cook, Miz Helen's Country Cottage's Full Plate Thursday and It's a Keeper Thursday. Prep Time:~10 mins Cook Time:~10 mins Yield: 36 pcs. 1. Preheat oven to 350F. Line 3 cookie sheets with parchment paper. 2. Mix butter, white sugar and brown sugar. 3. 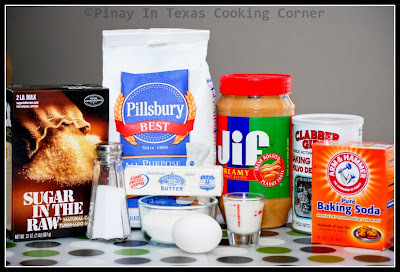 Add peanut butter, egg, milk, vanilla, baking powder and baking soda and mix well. 4. Add flour and mix until well blended. Fold in the white chocolate morsels. 5. Put a scoop of dough into your hand and roll into a smooth ball. 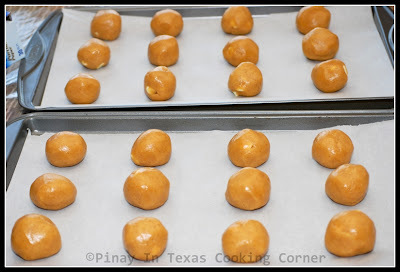 Place the balls of dough onto the lined cookie sheets. 6. Put a bit of sugar on a small plate. Press a fork into the sugar and then into each cookie. Press in both directions to create a crisscross design. 7. Bake for 8 to 10 minutes. Don't over-bake, unless you like a crunchier cookie. 8. Let cool for 1 minute on baking sheets before transferring cookies to a wire rack to cool completely. * Did you know that peanuts contain RESVERATROL? Resveratrol is a natural antimicrobial compound found naturally in foods such as grapes, red wine, peanuts and some berries that helps to protect against bacteria, viruses and fungus. Research shows that resveratrol has anti-aging capabilities and acts as an anti-inflammatory compound as well as an antioxidant which increases the body's energy and lowers the level of sugar in the blood. One cup of boiled peanuts is said to have 0.32 - 1.28 mg of resveratrol and one cup of peanut butter is said to contain 0.04 - 0.13mg of it. Thanks for stopping by my blog earlier! I'm following you back. These look like good cookies! My family are peanut butter freaks!! Those cookies look yummy! Glad to find a recipe site like yours. I'm always on the lookout for new things to try. The cookies look amazing, no wonder they are a favorite. And nice of you to make them even when you don't like them. 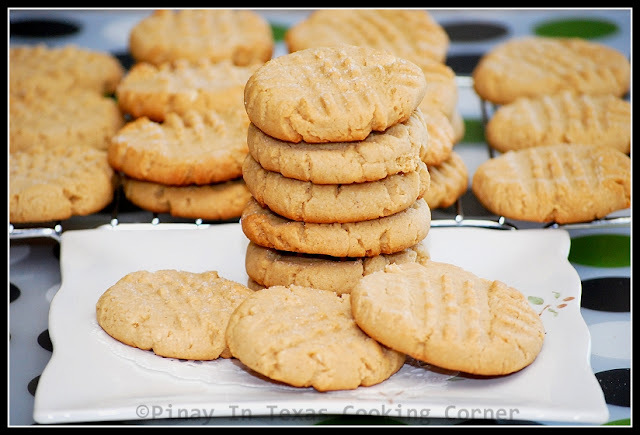 I love peanut butter cookies and your looks amazingly delicious, what a lovely presentation and recipe fantastic too! Peanut butter and cheese, haven't tried that yet :), I'm not fun either but once in a while I'm just curous how it taste when mix it with others. We are all peanut butter mad in our house. Those cookies sure look good. I'm sure Clarise will enjoy them a lot. I too don't like peanut butter .. and never tried to make cookies with them. Can see how gorgeous yours looking like :) ur daughters must be supper happy ! Hi Tina! Actually peanut butter and mac & cheese are something that I haven't tried even after living here for 15 years. I should, I know. But I just didn't get a proper chance to eat it (unless I cook it myself). 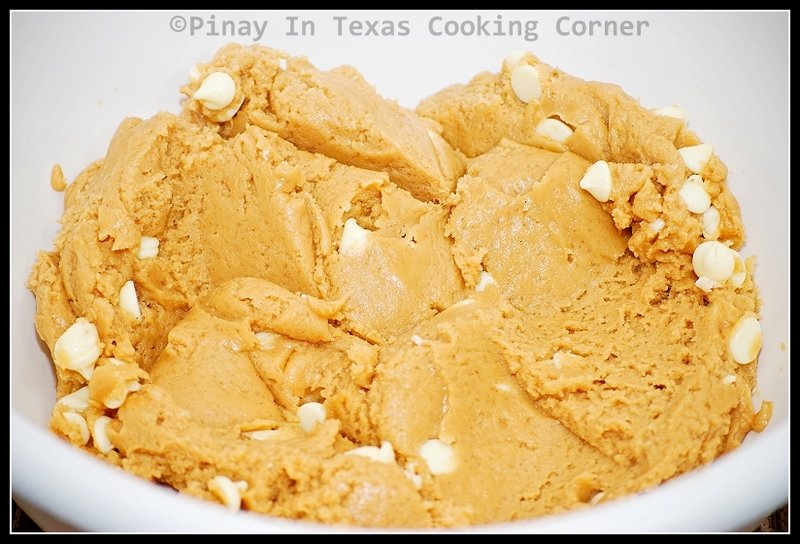 I imagine probably peanut butter cookies sounds tastier than peanut butter itself... I wonder if it's something you grow up with it so you like it kind of thing.... Your cookies look delicious! Crispy kind is my type. PB cookies are the bestest!! Those made my tummy grumble! They look so delish! Thanks for the add! Following you back! Looks yummy! Thanks for visiting my blog. I appreciate the comment. I am returning the follow and I just might try those cookies! Questi biscotti sembrano buonissimi,purtroppo qui in Italia non è facile trovare burro di arachidi...Dunque, posso soltanto guardare questa ricetta meravigliosa. Tina-One very important thing I love about your blog, since day one...is that you are so consistent in posting such great recipes that I want to copy-print right away to save. 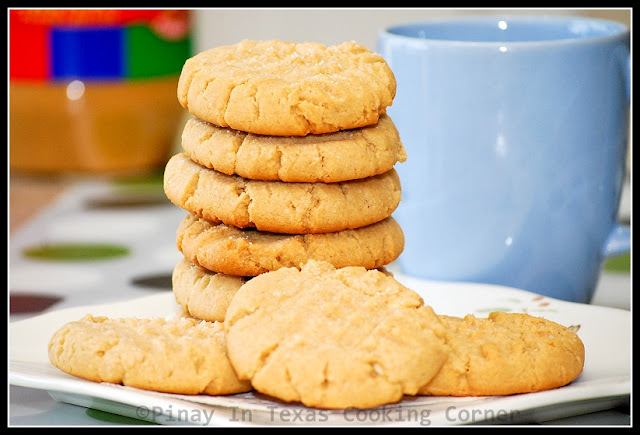 Love your version of the yummy Peanut Butter cookies. Tina, thanks so much for coming by to show off your cookies this week. They look great and I love your pictures :) Have a fabulous long weekend ! Hope you can come share more recipes again soon! 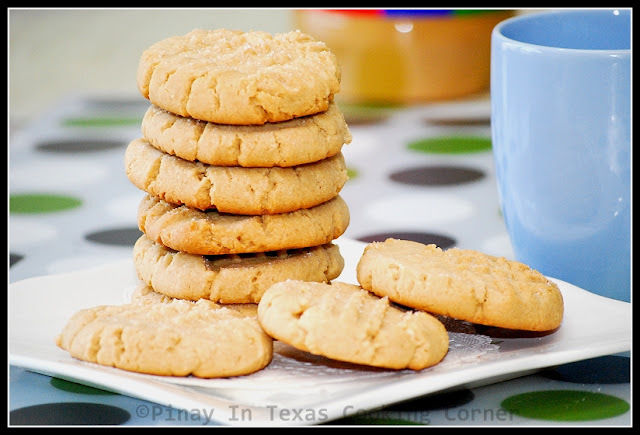 There is nothing better in the afternoon with tea than a classic Peanut Butter Cookie and your recipe looks delicious. Where is my cookie right now? Thanks for sharing with Full Plate Thursday and come back soon! How much vanilla? They look great, making them now! 1/2 tsp vanilla. :) Tnx for asking. It's only now that I realized I forgot to include it in the ingredients list.